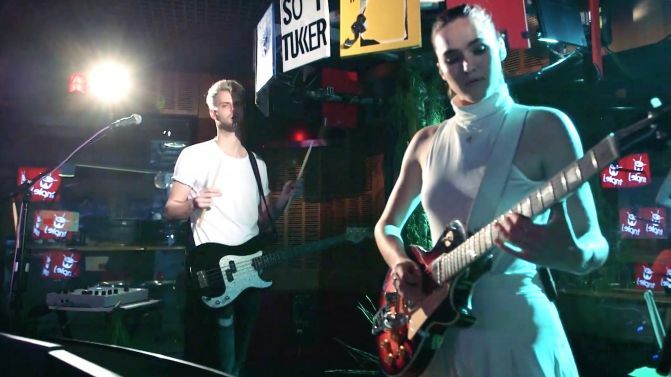 New York duo Sofi Tukker have made their debut on triple j‘s Like A Version covers segment, with a fresh take on Maggie Rogers‘ song ‘Alaska’. Performing the track with the help of their beloved ‘Book Tree’, the pair stayed true to the song’s melodies, but gave it some slightly warmer vibes than the original. While in the triple j studios, Sofi Tukker also performed their hit single ‘Drinkee’, completely with choreographed head-rolls. Sofi Tukker played their first-ever Australian shows earlier this month, at shows in Sydney and Melbourne. Watch the duo’s Like A Version performances, below.